Snapchat is undoubtedly one of the, if not the hottest social media channel to date. The app has 150 million users and is generating more than seven million video views every day. 3V Advertising stands for vertical, video and views. 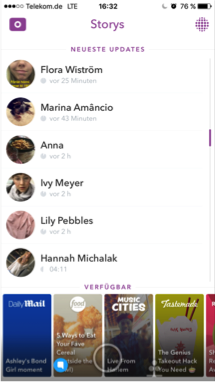 The video ads used by companies for their own advertising on Snapchat appear in between the stories of the user's friends. Using a swipe-up tool, users can view the extended content of a longer video, an article and an app install ad. The sponsored snaps, videos and photos will be included in your own feed, so that the user will see a content mix from friends, publishers and ads - as is already the case on Instagram, Facebook etc. Firms like Vans of the Wall, Trolli, bareMinerals and Spotify, with 26 million views, are just a few examples of Snap Ad campaign users. The Snapchat Discover Channel isn't new. Leading pulishers add new content every day to the channel. In addition to media brands such as CNN, Vice or Buzzfeed, advertising customers also have the option of using the Discover Channel. The company's own story can be arranged there or they can publish their story through the own company profile. Text articles, pictures, GIF's or 10-second-videos are ingredients of the tool, but the content are deleted after 24 hours. 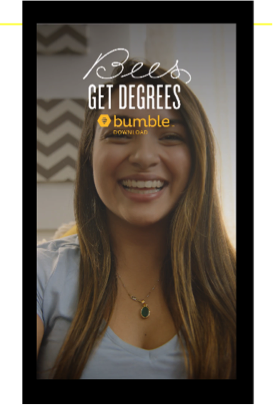 Advertisers can also buy on-demand geofilters. The small stickers are available for Snapchat users when they are at a certain location. Marketers can buy and create a geofilter for a certain event, their business or a certain location. Unlike geofilters for a community showing a city, university or sight, companies are allowed to show their brand logo or trademark. The company decides on a time frame and location for ots geofilter. The price is defined according to those factors. From a single apartment building to a whole neighbourhood, anything is possible from a couple of hours up to 30 days. Examples of companies using geofilters are Vans of the Wall, bumble or Google. Another interesting tool applied by companies to promote their brand are sponsored lenses. Marketers create a sticker that all Snapchat-user can use for their own pictures. Until now the lenses are still quite expensive for usage of only 24 hours. 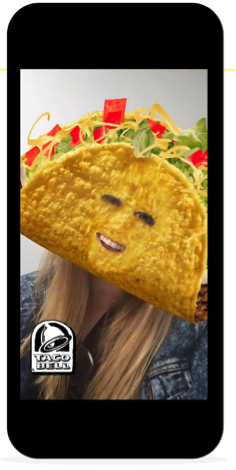 Companies like Kraft, Empire Fox or Taco Bell have already used sponsored lens campaigns. App ad in an app - sound impossible? Well, it isn't with the App Install Ads in Snapchat, where companies encourage users to download an app. 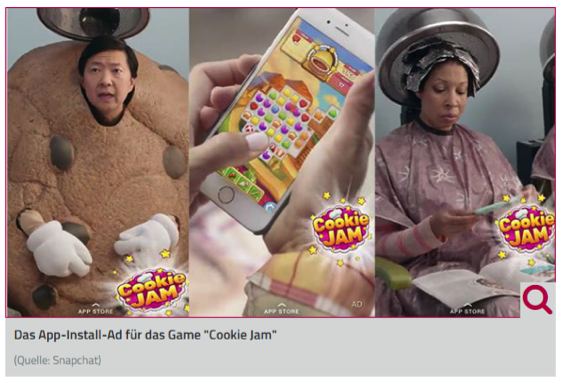 The first App-install-Ad campaign was developed in order to download the game "Cookie Jam". To do so, a shortened version of a commercial was played and by swiping up, users were directed to the app store without even leaving Snapchat. Snapchat collaborates with the app analysing company "Tune" to "Tune" to analyze and evaluate the campaigns. How can brands buy and use the Snap Ads? Until now this is only possible by going through Snapchat directly. Marketer can buy their advertising surfaces through third-party suppliers so that the post is put into the app and appears between followers’ stories. API automates the process of the serving ad and provides higher flexibility on how far the advertisers can reach out. A self-service for companies hasn’t been published yet but is in the pipeline. In the future, this means that brands can book their ads independently without contacting Snapchat, as is already the case for Xing, LinkedIn or Facebook. Since Snapchat especially targets a young audience, it is assumed that company ads might be used for regional recruiting-marketing for young apprentices to look at the businesses directly. 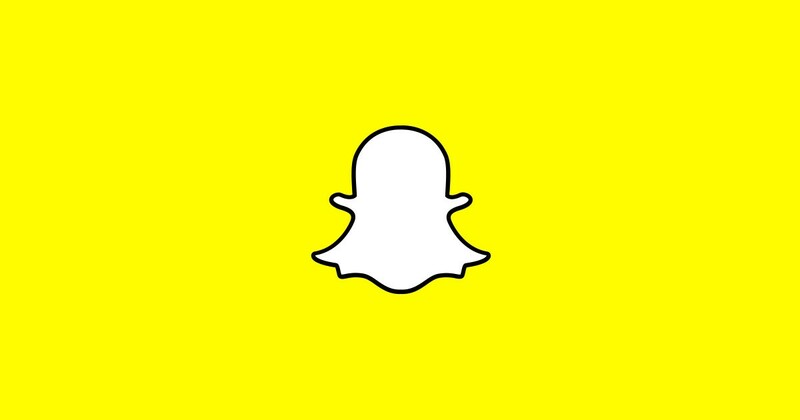 Next to the self-booking service for companies, Snapchat recently announced that they are also working on new display formats: Post-Story-Ads. Stay tuned for more.